Kilroy was here! The message appeared mysteriously all over Europe and the Pacific during World War II. 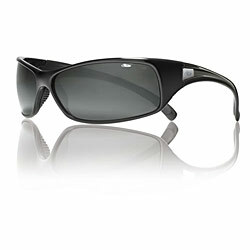 The phrase was scrawled on desolate beachheads, notable landmarks and on walls everywhere. The message was believed to have been left by an American, although it was often discovered by the first American troops to enter areas formerly occupied by enemy troops. The phrase irritated German and Japanese troops to no end but delighted (and also bewildered) American forces as it added much needed levity to the brutality of war. It also provided a great deal of mystery about who Kilroy was and how he got to so many areas of the war before anyone else. Kilroy was not the only one of his kind during World War II. The Canadians had their version (Clem) and the British had two (Chad and Mr. Foo), and there was one central to Los Angeles, California. At the conclusion of the war, the American Transit Association decided to put a face on the mysterious Mr. Kilroy. The Association sponsored a contest through its radio program”Speak to America” to draw out the phantom. Nearly 40 men stepped forward claiming the persona, but they declared James J. Kilroy of Halifax, Massachusetts the “Kilroy”. Mr. Kilroy explained that he was an inspector at the Fore River Shipyard in Quincy, Massachusettsas and as part of his work he would check to see the number of rivets that had been completed each day and would mark a chalk line where the work had ended. Some of the riveters, however, would go behind him and erase the chalk marks. Thus when an second-shift inspector came by, not seeing the chalk marks, he would mark them again and thus the riveters would be paid twice for their work. 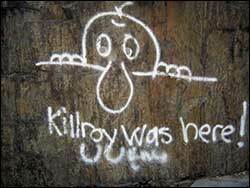 Once wise to their game, Kilroy decided to include his name in big bold letters stating that “Kilroy was here” as well as the amusing drawing. The riveters deception ended soon thereafter. 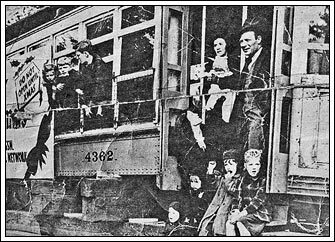 James Kilroy and his family with the trolley car he was awarded. In order to prove that he was the real “Kilroy” he brought forth co-workers from the shipyard, as well as some of the riveters, who vouched for his story. The Association awarded him a 22-ton streetcar which he eventually converted into sleep quarters for some of his children. James Kilroy died in Halifax on Nov. 24, 1962.